Hundreds of people are still missing after a Philippine ferry carrying more than 800 people capsized in a typhoon on Saturday. Only 38 survivors have been found - 28 of them in a coastal village after they had been drifting on a life raft for some 24 hours. Navy divers hope to drill into the side of the upturned vessel in case passengers remain alive in air pockets. A US Navy ship, the USNS Stockham, is on its way to help with the search. Elsewhere in the Philippines, the storm has left more than 160 people dead. The Princess of the Stars ferry left Manila on Friday en route to Cebu, and according to its owners, Sulpicio Lines, contact was lost at about 1230 (0430 GMT) on Saturday. Twenty-eight survivors - most of them men - were found in a coastal village in Quezon province on Monday, DZBB radio reported. Reports later suggested another group of survivors had been found on one of the three islands that comprise Masbate province, but they are so far unconfirmed. Battling huge waves, a rescue ship only managed to reach the ferry more than 24 hours after it lost radio contact. Coast guard divers who rapped on the hull had received no response, officials said, and rough seas were hampering search efforts. An attempt to drill holes into the upturned hull to search for survivors in airpockets was abandoned as darkness fell on Monday, and officials expressed little optimism. "We feel there is no life inside," said Lieutenant-Colonel Edgard Arevalo, a navy spokesman, according to Reuters news agency. The first four survivors to be found on Sunday told local media about their experiences. One of them, Renato Lanorio, said he had been on the top deck when a crew member ordered passengers to put on life jackets at about 1130 on Saturday. He said that about 30 minutes later, the ship tilted and elderly people and children slipped on the rain-soaked deck. Another, Jesus Gica, said he was worried that many people had been trapped below deck. "There were many of us who jumped overboard, but we were separated because of the big waves," he said. "The others were also able to board the life rafts, but it was useless because the strong winds flipped them over." The 23,824-tonne ferry has a passenger capacity of 1,992. There is some confusion over the number of people on board. Officials initially reported it was carrying 747 passengers and crew, but on Monday said there were some 100 more. The Philippine President, Gloria Arroyo, has demanded an explanation as to why the ferry was allowed to leave port on Friday despite warnings that a typhoon was about to hit. "Why did you allow it to sail and why was there no ample warning? 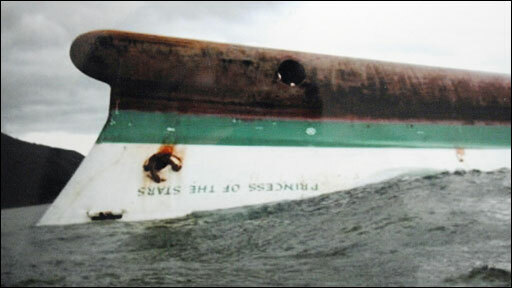 I want answers," she told civil defence and coast guard authorities during a briefing on the accident. Worried relatives have been gathering at the offices of Sulpicio Lines. "You can't bring our loved ones back. You should be held responsible," one distraught woman told staff at the company, according to Reuters. Vessels belonging to Sulpicio Lines have been grounded pending an investigation and inspections of its other boats. But the company says it was given permission to embark by the coast guard. Typhoon Fengshen swept across the central Philippines on Saturday. In Iloilo, a central province where 101 people were reported dead or missing, chief administrator Manuel Mejorada said most of the victims had been killed as a result of flooding caused by the storm. "Yesterday there was hardly any villages and communities which were not under water, and where the people were literally stranded on rooftops with no food and no water, and chilling in the cold. "Right now the floodwaters have receded, and we are shifting our efforts to bringing food, water, medicine and clothing," he told the BBC. At its peak, the storm was packing gusts of up to 93mph (150 km/h). It changed course on Sunday, hitting the capital Manila with heavy rainfall at dawn. Hundreds of thousands of people across the country have been evacuated from their homes. Many roads are blocked and there have been widespread power cuts. Are you in the Philippines? Have you been affected by the typhoon? Send us your comments and experiences using the form below.